Here is the story as told through Southern folklore….As General Sherman (yes, our General Sherman) marched his Union Troops farther south they stumbled upon a small town outside of Savannah, Georgia. Instead of trying to fight off the Union soldiers, the people of this small town decided to do what any good hospitable southern community would do…they threw a ball. And what is a ball without punch, spiked punch that is. Instead of fires and bloodshed, there was music, dancing and punch. The punch was said to be so good in fact it went down in Civil War History! And if you go down to that little town in Georgia, they will tell you the only force mightier than General Sherman himself is their punch. 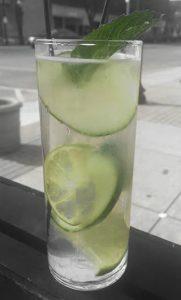 *Any of our premium spirits mixed with Gosslings ginger beer and fresh lime juice. We will happily serve them in a stainless steel mug…but we ask to hold a credit card otherwise they will be made in a mason jar.